I’ve enjoyed the pleasure of growing my own vegetables, for a few consecutive years, but the french partridge and pigeons feasted more on my bounty than myself! I gave up. The location of my garden is just too exposed to the local wildlife! So when I discovered a local supplier Maxwell and Webb Potager who were based in Berkshire, a couple of miles away from me I was absolutely delighted. 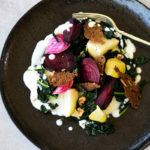 In actual fact I first met Clair at Marlow Market this summer, her stand was brimming with candy beetroot, watermelon radish, tomatoes, mouli, cavollo nero, chilli plants and much much more. You cannot compare these vegetables with those supermarket vegetables shipped in from all around the world as I don’t know how fresh they are compared to the vibrant, bursting with flavour and nutrition contents of Maxwell Webb and Potager. Most importantly, I love that their produce is seasonal, freshly picked, high quality with 100% provenance. They grow all their vegetables, plants and chillies from seed and work with organic practices, hand in hand with nature. Not only that they keep their food miles low, therefore supply within a maximum of a 10 mile radius. It’s high quality. Clair and Chris are RHS trained and bring a wealth of plant and culinary knowledge to the business, working with nature and use companion planting for pest and plant disease control. I had to create something special with these wonderful locally grown vegetables. This recipe is relatively easy to create, obviously the cooking time of the beetroot can vary according to the size. I would recommend using cavolo nero but standard kale works too. I have used my dark sourdough rye bread to make the rye crisps, it’s easy to cut very thinly after a few days of baking the bread. Set the oven to 200°C. Wash the beetroot. Cut a large piece of foil and place all but two of the beetroots on the foil, drizzle with a little olive oil, 2 tablespoons of water, salt and pepper and wrap and the beetroot up into a parcel and place on a baking tray. Bake for 35 minutes in the centre of the oven. Open up the parcel and continue to bake for 25 minutes or until cooked through. In the meantime prepare the remaining beetroot, wash, peel and slice very finely, if you have a mandolin this will do the job perfectly. If you’re using different coloured beetroot you’ll have to pickle them separately as the colours will bleed. Mix the water, vinegar, sugar and salt and stir until dissolved. Place the beets into a non reactive bowl and pour over the pickling solution. Leave to pickle for at least 25 minutes. Brush the rye bread with a little olive oil and roughly chop the walnuts, bake in the oven until crisp and the nuts golden, approximately 5 minutes. Wash and de-vein the kale, cut into approximately 4cm pieces. Have a pan of salted boiling water ready and blanch for 3 minutes, plunge into ice cold water. Drain and squeeze out any excess water, unfurl the leaves and place onto a piece of kitchen paper ready to sauté. In a frying pan add a little olive oil and heat to high add the kale and season, sauce for a couple of minutes. Pour the milk into a saucepan, heat to boiling point and reduce the heat to low, crumble the chèvre into the pan and whisk vigorously. 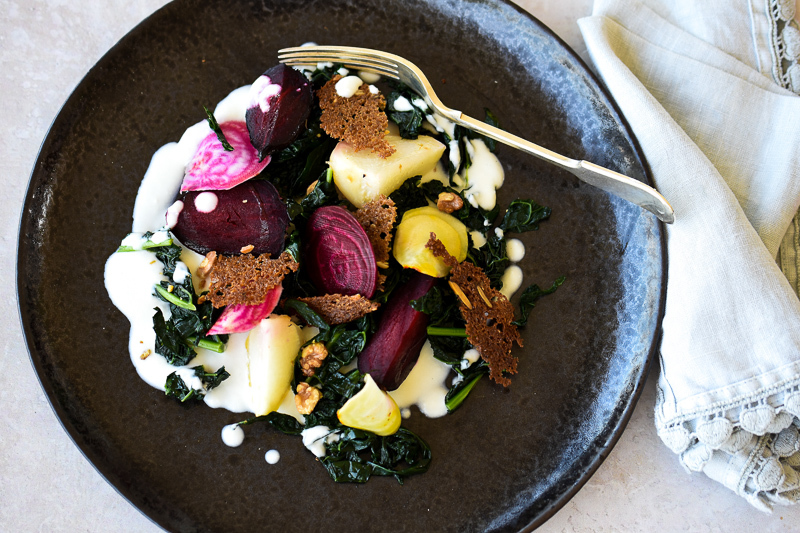 Spoon the chèvre cream onto the plate, cut the roasted beetroot into quarters or sixths, depending on the size. 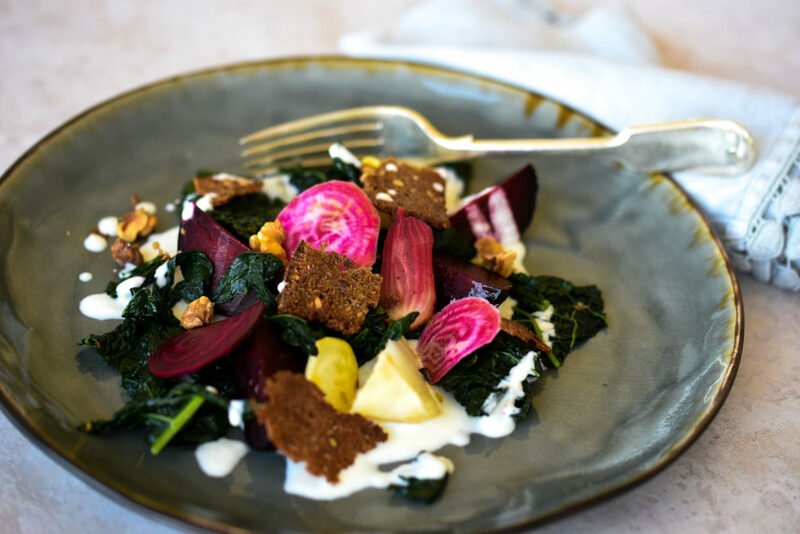 Arrange on top of the chèvre cream along with the kale and then the slices of pickled beetroot. Top with the rye crisps and roasted nuts, serve warm.